At CH Pest Control Salisbury our aim is to ensure that your business complies with current pest control legislation and recommended best practices. We offer a pest control service at times to suit your business including out of hours arrangements. On each visit we will apply the appropriate pesticides and monitoring devices necessary to treat and control the infestation covered in the service contract. Our clients will be made aware of the location of the baiting points and treatment situations. We will create a written report on each visit detailing our findings and treatments plus make a note of any specific recommendations highlighted from the inspection. CH Pest Control Salisbury provide an affordable rapid response to your business pest problems in Salisbury, Wiltshire & the surrounding areas of Blandford, Bournemouth, New Forest, Southampton & Wimbourne. CH Pest Control Salisbury will quickly deal with your pest problem. Our intention is to minimize the health risks and protect you, your business and your customers. We provide a rapid response to business pest control emergencies in Salisbury, Wiltshire & the surrounding areas of Blandford, Bournemouth, New Forest, Southampton, Andover & Wimbourne. Our mobile pest control technician will visit your business, investigate and solve the problem usually in one visit. Our extensive technical expertise allows us to identify pest solutions based on our knowledge of pest behavioural patterns, their infestation rates and the likely recurrence levels. 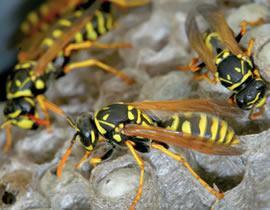 Latest Pest Control Alert - Watch Out for Wasp Nests! During April until early June, the queen wasp will leave hibernation and begin building a brand new wasp nest in a new location. The queen wasps will often build the new wasps nest in roof voids wall cavities or in outbuildings. During June July and August they will continue to expand their wasps nest and by September the nest could have thousands of wasps in it. CH Pest Control Salisbury have a 24 hour emergency call out service covering Salisbury, Wiltshire & the surrounding areas of Blandford, Bournemouth, New Forest, Southampton, Andover & Wimbourne. Call 07580 072 484 for details of our pest control solutions and 7 Day / 24 hour call out service.